Rebranding Altia’s Koskenkorva earned it the brightest victory, Grand Effie, in the Effie Awards Finland 2017. The campaign entitled Koskenkorva – Vodka from Finland was produced by Bob the Robot. “Enhancing the Koskenkorva brand is a textbook example of how repositioning a product around strong basic values and dramatizing the message increases sales – particularly exports, in this case,” the jury stated in its justification for the Grand Effie winner. Koskenkorva also received two Gold Effies in the Products and Services and the Business Challenge categories. “When the product and brand face a business challenge and need a renaissance, this is how it is done. Finnish marketing skills at their best, meaning world-class,” says Chair of the Jury Tomi Wirtanen, Marketing Director of Elisa Oyj. Koskenkorva is an internationally awarded vodka and one of the most iconic brands of Finland. International consumers were not aware of the unique history of Koskenkorva and how the product is linked to a small Finnish village, so an appealing story was constructed around this idea. “Uncompromising, ambitious marketing planning, wonderful marketing communication that evokes emotions, clear objectives and results – this is the recipe for success in productive marketing. I am very proud,” says Sanna Kolamo, Vice President of Sanoma Media Finland’s B2B marketing. In the Products and Services category, a Gold Effie also went to KONE and hasan & partners who showed all lift passengers what the mystical Internet of Things can be in practice. Lifts conversing with each other intrigued passengers and strengthened KONE’s profile as a technological pioneer. Help Your Fellow Man (Auta ihmistä) of the Salvation Army and Make It Simple succeeded in bringing the less fortunate close to everyone by including public figures in the campaign. The idea that anyone can suffer misfortune, the concise message and humane photographs made this a major topic of discussion. The work was awarded a Silver Effie. Silver was also given to Sanoma Media Finland’s Oikotie and Intohimotoimisto Cassius. The pain of letting go and starting fresh was successfully turned into an opportunity, and Oikotie was profiled as a path towards successful changes in life. A Bronze Effie went to McDonald’s Finland and DDB Helsinki. Their marketing effort succeeded in impacting large masses in an extremely competitive industry where price plays a major role. The Gold Effie in this category went to a clothing line that should not exist. The maternity clothing line for children attracted the attention of more than 70 million people around the world. Plan International Finland wished to draw attention to the problem of underage pregnancies. The campaign was designed by hasan & partners. Silver was awarded to the Crisis Management Initiative campaign Don’t Tell Martti (Älä kerro Martille), which raised a substantial sum of money for peace work. The gem of the campaign was its unexpected approach, the media use of a Nobel Prize winner. Offering rental housing on Tinder is definitely an example of something entirely new and astonishingly daring. The exceptional strategy of Lumo and TBWA\Helsinki produced remarkably good results and earned them a Bronze Effie. Altia and Koskenkorva also won a Gold Effie in the Business Challenge category. 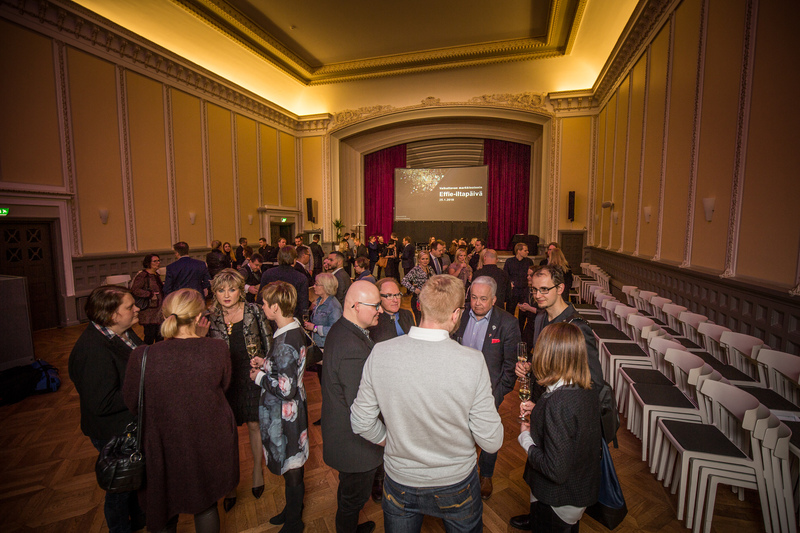 A second Gold Effie went to the campaign of Metsä Wood entitled Plan B – The City Above the City, produced by hasan & partners. When plots run out in the cities of the world, we can always add more floors on top. This was proven by Metsä Wood as it showed how more can be built in the global metropolises – by going up. Wood construction and efforts to save the world received global media coverage. Silver Effies went to KONE Machine Conversations and the Don’t Tell Martti campaign. A Bronze Effie was handed to Lumo and TBWA\Helsinki for their profile-changing marketing for rental housing. Another Bronze Effie was awarded to Fira Palvelut and Viestintä Oy Drum. The Fira Ketterä concept and its skilled communication is a textbook example of how a product should be developed from the customer’s perspective while transforming the entire industry. The third Bronze Award in this category went to the Help Your Fellow Man (Auta ihmistä) campaign of the Salvation Army. - Puolessa vuodessa kansan rakastamaksi brändiksi. Kun aika on. MTL is an association representing professional marketing and communication companies. MTL unites companies that use marketing communication to improve their customers’ competitiveness, create growth and generate business results. The combined margin on sales of MTL’s member agencies is about half of the total margin on sales of marketing communication in Finland.